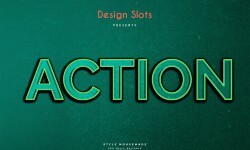 This retro type effect works with smart objects and will transform any text into a striking title. To edit,Use the smart layer to apply the bold 3D effect to any text or shape with ease. Than save the PSD file and you’re done!